I keep a gallon bag of meatballs in the freezer for a quick dinner. It’s one of my “emergency” meals. Don’t feel like cooking? Grab the bag of meatballs and a bag of marinara from the freezer in the garage. If the oven and stovetop could turn themselves on, dinner would cook itself. 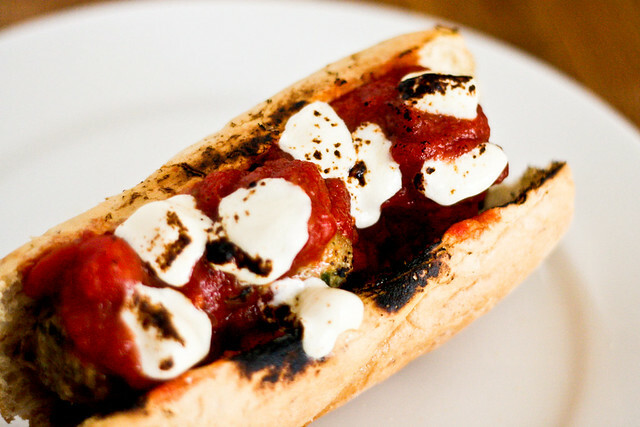 The preferred method for consuming meatballs in our house is sandwiched inside a crunchy baguette, smothered with stretchy, melty mozzarella cheese. The other preferred method is sliced on top of our favorite pizza crust, baked with stretchy, melty mozzarella cheese. You can’t go wrong either way. But who doesn’t love homemade pizza? 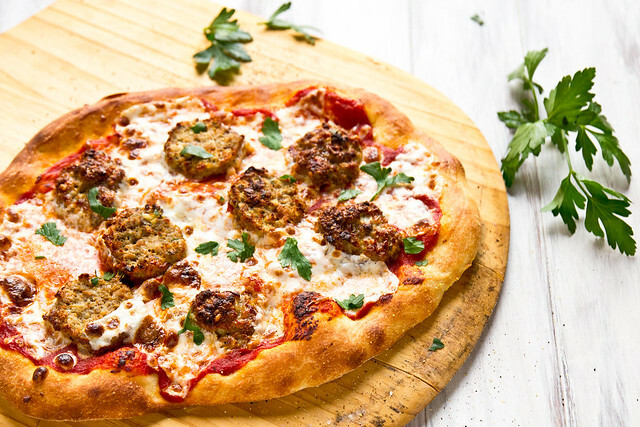 Leftover meatballs get new life on top of a meatball sub pizza. Dust a pizza peel or your baking sheet with a light dusting of flour and a couple of generous pinches of cornmeal and set aside. Cut each meatball into 3-4 slices. Spread a thin layer of marinara over the pizza crust (depending on how thinly you stretched your pizza, you might not use it all). Sprinkle with 3/4 of the mozzarella, top with meatball slices, and then the remainder of the cheese. 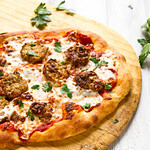 I love meatball subs but have never thought of putting them on a pizza, fab idea! Lloyd will DIE! Must make for him! We’re having pizza tonight, but sadly there are no meatballs hanging out in my freezer. Next time for sure, it looks great!! What a great idea to stockpile meatballs for don’t-wanna-cook nights! Love that, and love the look of this pizza… mouthwatering, to say the least! hi, i found your blog from clicking to one blog from another, then another, then another 😉 i’m loving all your food shots, and of course, your prop board! i’ll make sure to bookmark you guys so that until I am ready to purchase! It will definitely make a lovely addition to my food blog (I, too, am a picture-taker!). Loving your pizza posts, by the way! I sent this to my husband because he always requests meatballs on pizza. Making it this weekend. Question – do you freeze your meatballs cooked or uncooked? I would love to make a big batch of them to freeze, but wanted to make sure that if you do freeze them uncooked you can pop them frozen into the oven. Uncooked, it just takes ~5 more minutes in the oven when they’re frozen. That sandwich would be a big mouthful – just the way my husband likes them. Great ideas here. I really need to start considering pizza more often when I’m devising clean-out-the-fridge meals. this looks like the ultimate comfort food. Can’t wait to make this! I seriously think this might be the best pizza ever to be created.